Have we told you lately that we love the geometric trend for weddings? We really do! This week we wanted to show you this versatile garland that can be customized to your wedding palette (or home decor!) that only needs the manageable skills of tracing, cutting, folding and gluing to complete! What do you need to get started? Just some basics: thick paper or cardstock (I used watercolor paper), scissors, tape, basic craft glue, your favorite string or narrow ribbon and any type of paint you feel like using (or use colored card stock and skip it altogether). At the bottom of the post, you'll find templates for cubes and octahedrons (diamond) so your shapes come out just right! Rather than cutting the template out and using it like a stencil, just tape a printout of your shape on top of your chosen paper. Trace over the lines with firm pressure to leave an indentation where you need to cut (solid lines) and fold (dotted lines). Pro tip: Use a ruler or something with a straight edge to keep your lines straight. If you want to paint an image or pattern, paint BEFORE you cut. It keeps you from having to handle the cutout with wet paint. If you're going the spray paint route (I used Rust-Oleum Hammered Effects in copper on half), cut the shape out first, spray second. 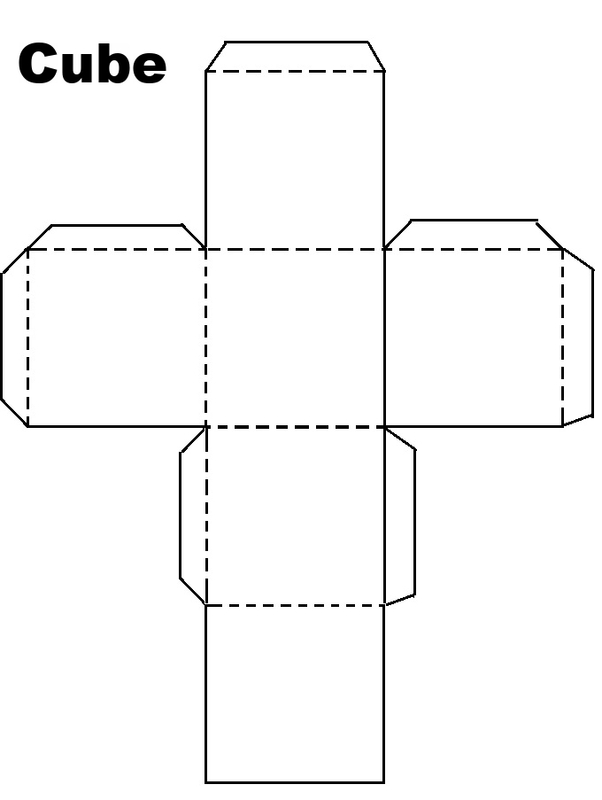 Cut your shape out, then fold up along the dotted lines. The tabs on the end can be a little difficult with thicker paper, but placing the same straight edge you used to trace along the line and folding up makes everything easier. Once you've folded along the lines, you'll start to see your shape taking form. Use a quick-dry glue to secure the tabs inside the shape. You can also use an invisible gift-wrap tape to speed up the process. Leave one side open for the moment. Before closing up the shape, cut a length of your string or ribbon and tie a couple knots on top of each other at one end. Stick the knotted end inside your shape, then close it up. Use the free end of the string to hang each shape to a horizontal length and you're finished! String that pretty garland up anywhere you want a little decoration, then hang onto it to use in your home later! As always, shoot us an email if you need any help figuring out what you want to DIY for your big day and we'll be happy to help! Click on the templates to open, save them to your computer and print them in any size you want!